i'm not sure if it's a worrying fact, or one that should be accepted as an oblique part of absorbing cycling into the mainstream, or perhaps, more likely, the opposite. lots of us have carbon with bendy bars and skinny wheels sitting in the bikeshed, machinery that all but demands lycra and/or sportwool. the latter can be comfortably considered as necessary apparel for the weekend warrior, as well as those with a competitive gene in the sock drawer, but as a sartorial necessity in a day to day basis, dupont's finest lacks that certain something. it may well be that zooming is all you expect from velocipedity; the daily travail does not impinge upon daily travel, in which case you may wish to go off and oil a chain for the next few minutes. but as cycling infiltrates the mainstream, particularly for those of us who have foregone personal motorised transport, it is ultimately necessary for many a good reason, to blend in a bit more than the average liquigas top will allow. at one time riding as a civilian led many to resort to resort to plain clothes; however, that seam in the seating area of a pair of levis does not lend itself to comfort, and a cotton t-shirt or shirt hardly fulfils the wicking promise. much as water finds its own level, leave too big a gap in the market, and someone will attempt to fill it, as indeed several have already done. one of those companies is swrve, a small company based in los angeles, usa, born out of necessity after the founders failed in their search to find a decent pair of cycling shorts that weren't made from black lycra. a company that only makes cycling shorts is unlikely to survive by legs and pockets alone, and swrve are no different; swrve uk sent not only a pair of black shorts and grey jeans, they thoughtfully included a softshell hoodie in case i felt in need of an asbo. long shorts, or short longs, are not a unique product in the world of leisure and fixie cycling: i have a number of similar garments occupying the shorts drawer in washingmachinepost cottage. the swrve pair of threequarters are fabricated from a mix of 38% cotton and two percent lycra to allow for a modest degree of stretch at strategic points. seen in context, there is little to distinguish the swrve variation from a regular pair of similar shorts, but to my mind that's the clever bit. the gusset at the crotch ensures that no seams can be sat on when in the saddle, while the zipped rear pockets (there's two front and two back) are incredibly deep allowing loose change to sit well away from the seating area. nice. these particular shorts are of the hipster variety, which may look as cool as mince, but seem hardly the stuff of which cycling shorts are made. perhaps it's the type of bicycles i ride, or perhaps i'm just an old fuddy duddy on the way to a simon cowal waistband, but the feeling that the shorts were falling down (they weren't) still hasn't gone away. 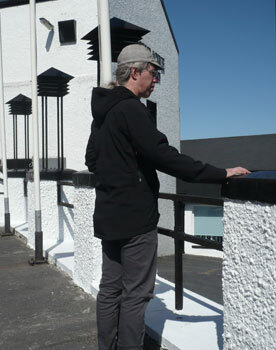 in order to give swrve the benefit of a bit of a hard time, i wore variations on a theme throughout the islay whisky festival week, covering more than a few hundred kilometres in the process. they got wet, they got sweaty (sorry) and they had to work for a living up and down stairs and into more still rooms than most will see in a lifetime. during this period of hard work, the seating area showed signs of wear and sheen. i should qualify this by pointing out that the fabric itself had not actually worn, it simply appeared the same as those faded jeans you can buy new at great cost. the fact that my brooks team pro caused a shiny area at the seating area was not unpalatable, but it was somewhat unexpected. shorts are perhaps the most practical lower wear for cycling, if only because it leaves no portion of material able to catch in those very sharp chainring teeth, but sometimes such a relaxed approach to apparel can be frowned upon in polite company. for this very purpose, swrve produce a pair of jeans style cycling trousers made from a similar mix as the shorts already mentioned. the no seams to sit on policy is continued here, as are the rather voluminous pockets of which the rear are also zipped. the fly zip and pocket zips fitted on both trousers and shorts are somewhat on the course and chunky side, but likely a lot more robust than some of those fitted to the racey stuff. none showed any sign of malpractice during the test. the really, really clever bit on the trousers relates to keeping those hems and lower legs away from wildly spinning chainsets and cranks. 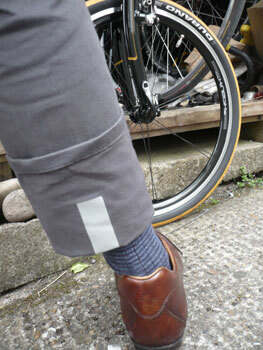 turning up the bottom of each leg reveals a substantial scotchlight strip at the back; an alert to any following traffic with headlights when pedalling after dark. art lies in the details. despite being made from the same constituents as the shorts, there were none of the wear and shiny signs on the trousers; with the weather being less than kind and the mercury not rising too far, these were worn more often than the shorts. 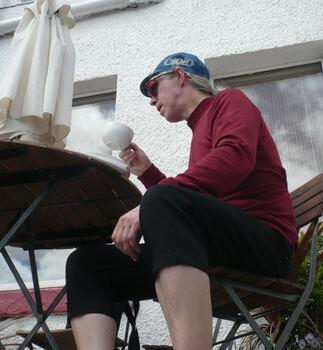 as could perhaps be expected, a pair of legs will get more hot and bothered in trousers than in shorts, but even though a couple of rides were a tad faster than was seemly, hot and bothered wasn't as desperate as it could have been. the cut was similar to the shorts; not even close to simon cowal territory, but i did like these. the last swrve item that allowed emulation of a civilian, and one of the funkier variety at that, was a softshell milwaukee hoodie. fleece lined and as softshell as a softshell can get, you'd have thought this a bit over the top for late may. sadly, on more than one occasion a fleece-lined softshell came in very handy as british summertime edged closer without heating up. should things become a bit warmer in transit than is strictly comfortable, there are a couple of zipped vents under each arm which definitely help in the cooling stakes. two front pockets in which hands can be stuffed when standing about on street corners are a nod to normality. just make sure you wear it with the hood up trying to look menacing next to that fixed gear colnago. the sleeves have hidden internal cuffs to aid cycling niceties, but without destroying any street cred you may have managed to acquire on that street corner. a drop tail covers your behind from spattered spray off the back wheel (mudguards ain't cool apparently), and there's a zipped, full width, enormous back pocket for lots of small stuff, or maybe one enormous stuff. the outer shell is promoted as wind and water resistant; a wind-resistant softshell is largely unremarkable, that's kind of what softshells are supposed to do, but the water resistance of this item surpassed my lowly expectations. 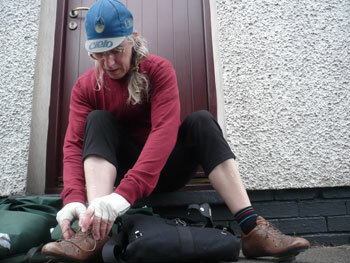 i have worn many a water-resistant garment that has turned out to cower in the spray from a passing car. the milwaukee softshell survived solid rain for 15km without letting the jersey underneath even taste a dribble of water. very convincing. i doubt i am the target market for any of these items, which makes it all the more welcome that i thought/think all three items are particularly adept at their given task. if the need to look less pelotonic has started to impinge upon your cycling life, you could do worse than take a look at the swrve range. it's not for everyone (i still haven't figured out what the point of the hood is on a cycling jacket), but that relates more to the styles on offer rather than the impeccable construction, a factor that seems all but beyond reproach. 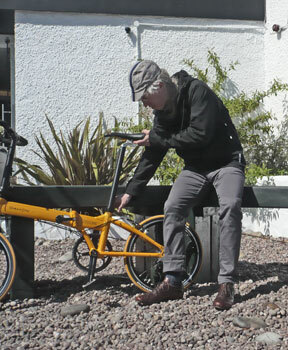 the swrve threequarter shorts cost £56 and are available in waist sizes 28"-38"; the trousers cost £80 and are in waist sizes from 30"-36" and either 32" or 34" leg sizes; the swrve milwaukee softshell hoodie costs £110 in black red or grey, and sizes small to xl.